getcalc.com's Exponential Distribution Calculator is an online statistics & probability tool to model the time elapsed between the events to estimate reliability of applications in statistical experiments. 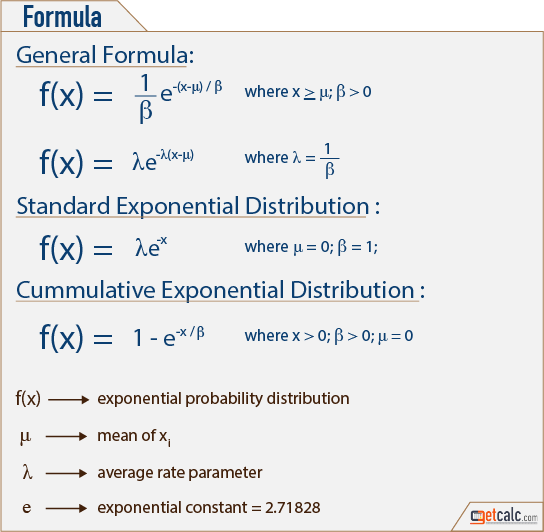 Exponential Distribution is a mathematical function or method used in the context of probability & statistics, represents the probability of reliability of applications by modelling the time elapsed between the events in statistical experiments. what is LCM of 9, 12, 18? what is the age now for 1991 born? what is 2.25 in fraction? 0.67 as a fraction form?